This illustrated book from the late 19th Century, covers a wide range of subjects concerning the devil and demonology in general. 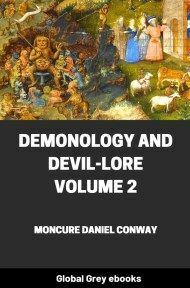 The author makes his way through the old Persian devil, Hindu ideas of demons, the Jewish Elohim, Lilith, Ancient Greece, wars in the heavens and on earth, Satan, the sin of man, the curse of knowledge, witchcraft, Faust, and the antichrist. A truly fascinating book.